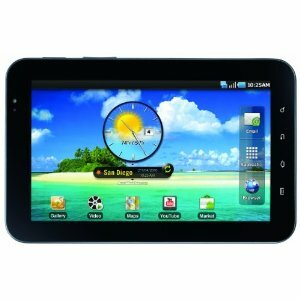 Samsung Galaxy Tab (Verizon Wireless) Tablet - review, specification, prices. Samsung Galaxy Tab (Verizon Wireless) Tablet is a powerful entertainment device ideal for home or on the go. 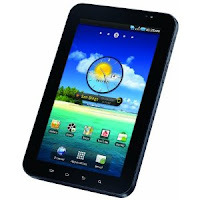 Weighing just 1 pound, it features a vibrant 7 inch touchscreen display with 3D like graphics, speedy 1 GHz processor, and the Android 2.2 operating system. This Samsung Galaxy Tab (Verizon Wireless) Tablet offers the fast speeds and reliability of the Verizon Wireless 3G network, you'll be able to connect to a wide range of streaming media choices and enjoy fast downloads of music, movies, and documents while on the go. Additionally, you can share your 3G mobile broadband connectivity with up to five other devices (laptop), another phone, MP3 player, and many more, using Wi-Fi. With integrated Google technology, the Samsung Galaxy Tab (Verizon Wireless) Tablet brings one touch access to the popular Google mobile services millions use every day, including Google Search by voice, Google Maps with Street View, Gtalk, YouTube, Picasa, and contacts/calendar synchronization. Support for Adobe Flash 10.1. 7-inch touchscreen display (1024 x 600 pixels, 16 million color depth) with 6-axis motion sensor and accelerometer. 3Mega Pixels rear facing camera with flash captures still images and video that that can be edited, uploaded, and shared. Multi-format media player compatible with MP3, WMA, and AAC music files plus DivX, XviD, MPEG4, H.263, and H.264 video files. Included 16 GB microSD card slot with support for optional cards up to 32 GB. Widgets including AccuWeather Clock, Daily Briefing, news and weather. Related Posts to "Samsung Galaxy Tab (Verizon Wireless) Tablet"
4 Comments to "Samsung Galaxy Tab (Verizon Wireless) Tablet"
Our Broncos Super Bowl 50 House Flag measures 28x40 inches,buy San Diego Chargers flags is constructed of 2-ply 100% polyester,Pittsburgh Steelers banners shop and provides a top cheap Philadelphia Eagles banners sleeve for hanging vertically from a wood flagpole or banner pole.Oakland Raiders banners usa The Broncos Super Bowl 50 House Flag is high quality screen printed with the logo as shown. Our Super Bowl Banner Flags are 2-ply,wholesale Oakland Athletics banners double-sided,cheap nfl flags and viewable and readable correctly on both sides. Fly your Broncos Super Bowl 50 House Flag with our 5'nfl sports flags wood flagpole and adjustable flag bracket. Please comment to Samsung Galaxy Tab (Verizon Wireless) Tablet - Laptop and notebook reviews Samsung Galaxy Tab (Verizon Wireless) Tablet, review, specification, and price. Please don't spam.